Tax forms that need to be retained for a minimum period of time. Press materials that need to be permanently deleted when they reach a certain age. Competitive research that needs to be both retained and then permanently deleted. Work visas that must be marked as a record so that they can't be edited or deleted. 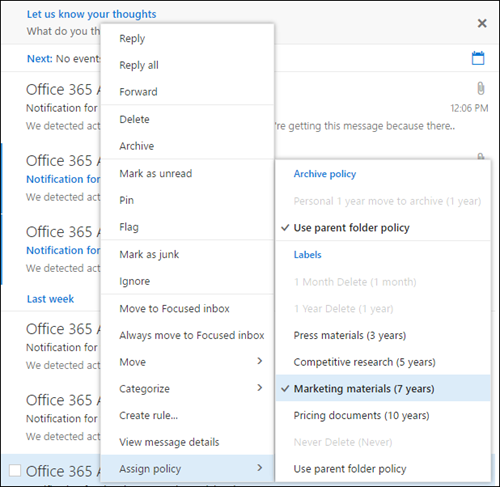 In all of these cases, retention labels in Office 365 can help you take the right actions on the right content. With retention labels, you can classify data across your organization for governance, and enforce retention rules based on that classification. Enable people in your organization to apply a retention label manually to content in Outlook on the web, Outlook 2010 and later, OneDrive, SharePoint, and Office 365 groups. Users often know best what type of content they're working with, so they can classify it and have the appropriate policy applied. Specific types of sensitive information. Specific keywords that match a query you create. You don't need to train your users on all of your classifications. You don't need to rely on users to classify all content correctly. Users no longer need to know about data governance policies - they can instead focus on their work. 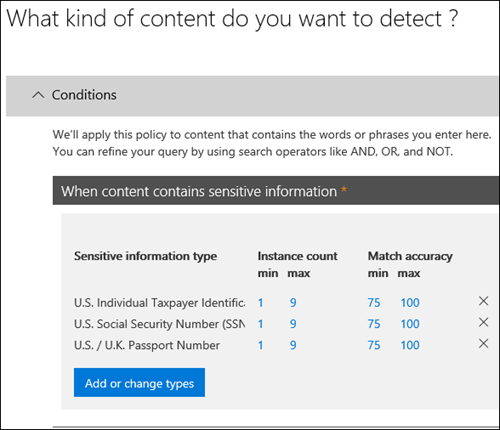 The capability to apply labels automatically requires an Office 365 Enterprise E5 license for each user who has permissions to edit content that's been automatically labeled in a site or mailbox. Users who simply have read-only access do not require a license. Apply a default retention label to a document library in SharePoint and Office 365 group sites, so that all documents in that library get the default retention label. Implement records management across Office 365, including both email and documents. You can use a retention label to classify content as a record. When this happens, the label can't be changed or removed, and the content can't be edited or deleted. 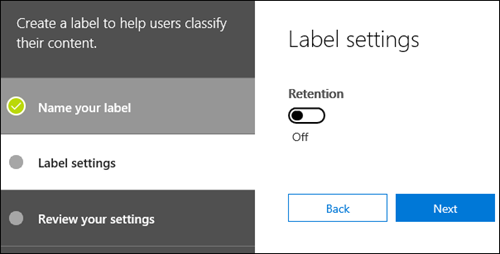 You create and manage retention labels on the Labels page > Retention tab in the Microsoft 365 compliance center, Microsoft 365 security center, or Office 365 Security & Compliance Center. Making retention labels available to people in your organization so that they can classify content is a two-step process: first you create the labels, and then you publish them to the locations you choose. When you publish retention labels, a label policy gets created. 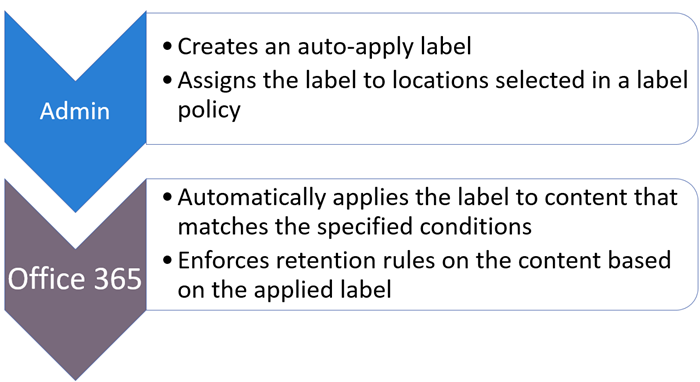 Retention labels are independent, reusable building blocks that are included in a label policy and published to different locations. Retention labels can be reused across many policies. The primary purpose of the label policy is to group a set of retention labels and specify the locations where you want those labels to appear. When you publish retention labels, they're included in a label policy. A single retention label can be included in many policies. Label policies specify the locations to publish the retention labels. For labels assigned manually by end users, people can remove or change the retention label that's assigned. If content has an auto-apply label assigned, an auto-apply label can be replaced by a retention label assigned manually by an end user. If content has a retention label assigned manually by an end user, an auto-apply label cannot replace the manually assigned retention label. If there are multiple rules that assign an auto-apply label and content meets the conditions of multiple rules, the retention label for the oldest rule is assigned. Manually assigned labels are explicitly assigned; auto-apply labels are implicitly assigned; an explicit retention label takes precedence over an implicit label. For more information, see the below section on The principles of retention, or what takes precedence?. All of the information in this section applies only to retention labels. Note that an item of content can also have one sensitivity label applied to it, in addition to one retention label. 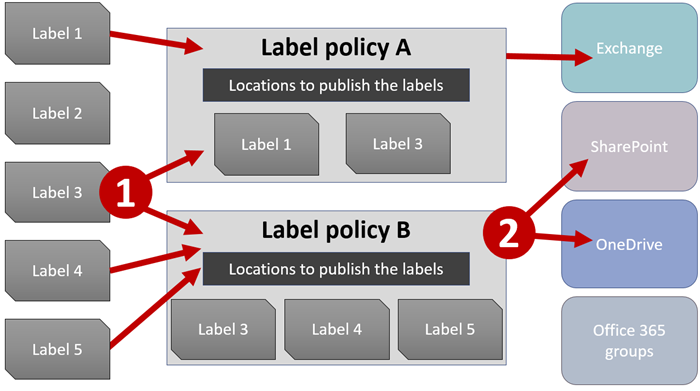 First the label policy needs to be synced from the admin center to the locations in the policy. Then the location may require time to make manual labels available to end users or auto-apply labels to content. How long this takes depends on the location and type of label. 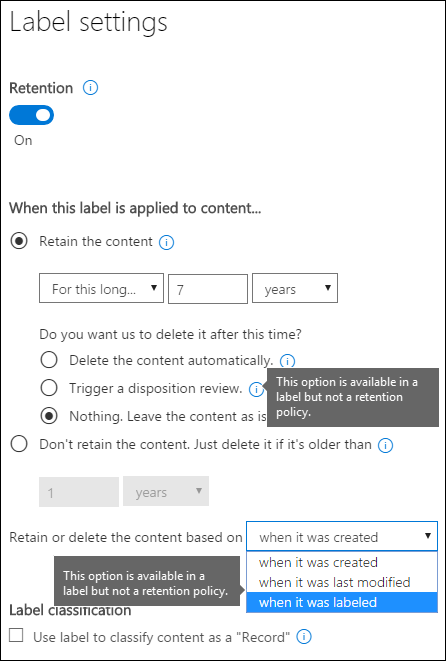 If you publish retention labels to SharePoint or OneDrive, it can take one day for those retention labels to appear for end users. In addition, if you publish retention labels to Exchange, it can take 7 days for those retention labels to appear for end users, and the mailbox needs to contain at least 10 MB of data. If you auto-apply retention labels to content matching specific conditions, it can take seven days for the retention labels to be applied to all existing content that matches the conditions. But note that after your retention labels are deployed, they are applied to new content quickly, typically in 15 minutes or less. In Exchange Online, retention labels are made available to end users by a process that runs every seven days. By using Powershell, you can see when this process last ran and thus determine when it will run again. In the results, the ELCLastSuccessTimeStamp (UTC) property shows when the system last processed your mailbox. If it has not happened since the time you created the policy, the labels are not going to appear. To force processing, run Start-ManagedFolderAssistant -Identity <user>. If labels aren't appearing in Outlook on the web and you think they should be, make sure to clear the cache in your browser (CTRL+F5). 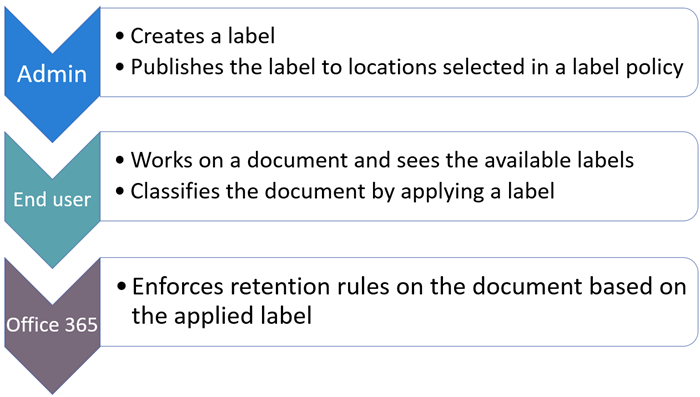 Different types of retention labels can be published to different locations, depending on what the retention label does. Note that in Exchange, auto-apply retention labels (for both queries and sensitive information types) are applied only to messages newly sent (data in transit), not to all items currently in the mailbox (data at rest). Also, auto-apply retention labels for sensitive information types can apply only to all mailboxes; you can't select the specific mailboxes. Note that Exchange public folders and Skype do not support labels. 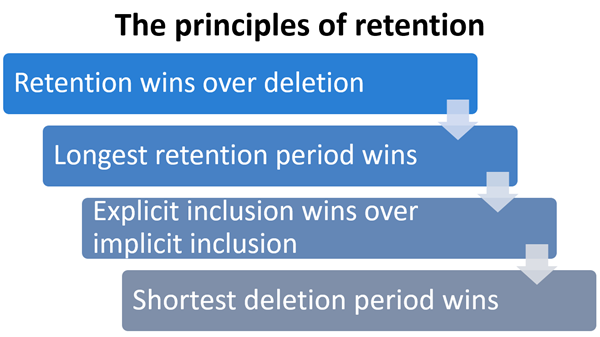 Retention labels can enforce exactly the same retention actions that a retention policy can. You can use retention labels to implement a sophisticated content plan (or file plan). For more information on how retention works, see Overview of retention policies. Trigger a disposition review at the end of the retention period, so that SharePoint and OneDrive documents must be reviewed before they can be deleted. For more information, see Overview of disposition reviews. Start the retention period from when the content was labeled, instead of the age of the content or when it was last modified. The sections below show how labels will appear in different apps to people in your organization. 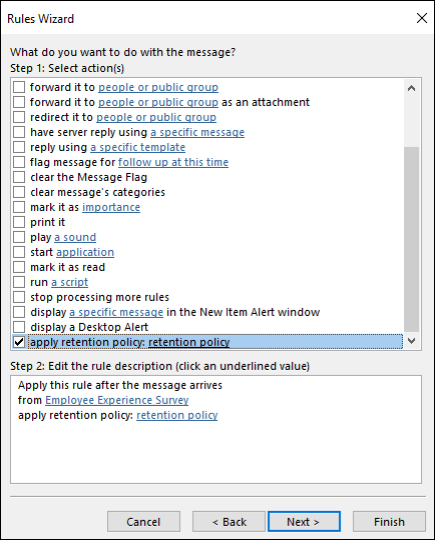 To label an item in Outlook on the web, right-click the item > Assign policy > choose the retention label. After the retention label is applied, you can view that retention label and what action it takes at the top of the item. If an email is classified and has an associated retention period, you can know at a glance when the email will expire. All items in the folder automatically get the same retention label, except for items that have had a retention label applied explicitly to them. Explicitly labeled items keep their existing retention label. For more information, see the below section on the principles of retention. If you change or remove the default retention label for a folder, the retention label's also changed or removed for all items in the folder, except items with explicit retention labels. If you move an item with a default retention label from one folder to another folder with a different default retention label, the item will get the new default retention label. If you move an item with a default retention label from one folder to another folder with no default retention label, the old default retention label is removed. To label an item in Outlook on the web, right-click the item > on the Ribbon > Assign Policy > choose the retention label. You can also apply retention labels to folders. This works the same in Outlook 2010 and later as it does in Outlook on the web -- see the previous section for more info. To label a document (including OneNote files) in OneDrive or SharePoint, select the item > in the upper-right corner, choose Open the details pane > Apply label > choose the retention label. 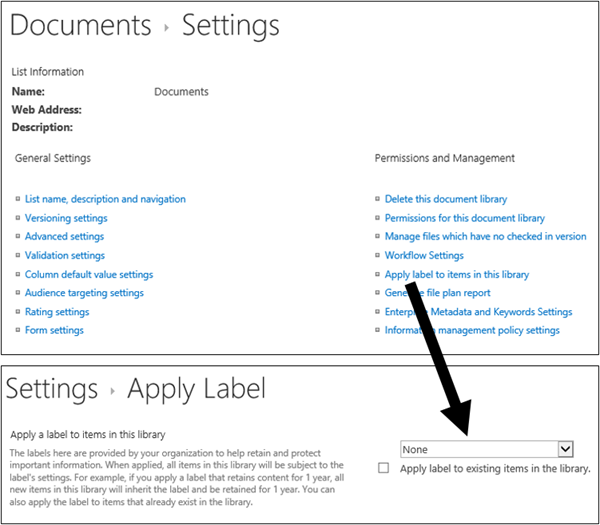 Note that you can also apply a retention label to a folder or document set, and you can set a default retention label for a document library - see the section below for more information. After a retention label is applied to an item, you can view it in the details pane when that item's selected. You can also create a view of the library that contains the Labels column or Item is a Record column, so that you can see at a glance the retention labels assigned to all items and which items are records. Note, however, that you can't filter the view by the Item is a Record column. When you publish retention labels to an Office 365 group, the retention labels appear in both the group site and group mailbox in Outlook on the web. The experience of applying a retention label to content is identical to that shown above for email and documents. To retain content for an Office 365 group, you need to use the Office 365 groups location. Even though an Office 365 group has an Exchange mailbox, a retention policy that includes the entire Exchange location won't include content in Office 365 group mailboxes. One of the most powerful features of retention labels is the ability to apply them automatically to content that matches certain conditions. In this case, people in your organization don't need to apply the retention labels - Office 365 does the work for them. Users no longer need to know about data governance policies - they can focus on their work. 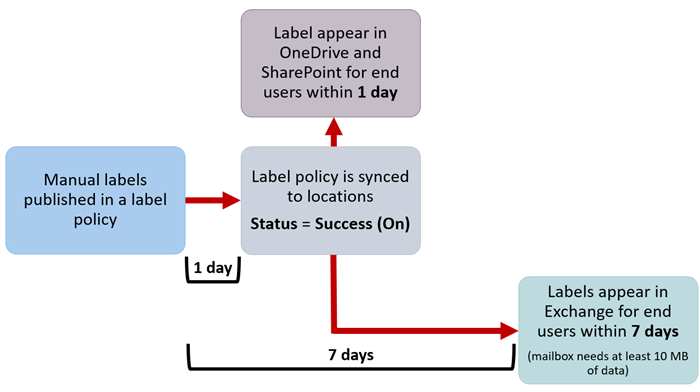 Note that auto-apply retention labels require an Office 365 Enterprise E5 subscription, and that it can take up to seven days for auto-apply retention labels to be applied to all content that matches the conditions, as described above. When you create auto-apply retention labels for sensitive information, you see the same list of policy templates as when you create a data loss prevention (DLP) policy. 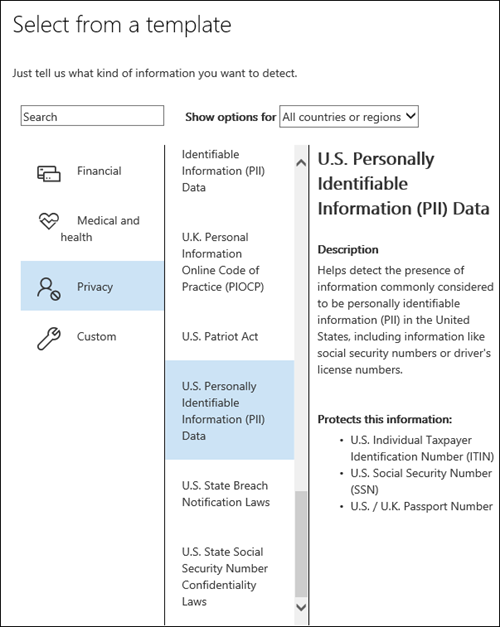 Each policy template is preconfigured to look for specific types of sensitive information - for example, the template shown here looks for U.S. ITIN, SSN, and passport numbers. To learn more about DLP, see Overview of data loss prevention policies. The content contains between 1 and 9 instances of any of these three sensitive information types. You can delete the max value so that it changes to any. The type of sensitive information that's detected has a match accuracy (or confidence level) of at least 75. Many sensitive information types are defined with multiple patterns, where a pattern with a higher match accuracy requires more evidence to be found (such as keywords, dates, or addresses), while a pattern with a lower match accuracy requires less evidence. Simply put, the lower the min match accuracy, the easier it is for content to match the condition. For more information on these options, see Tuning rules to make them easier or harder to match. You can auto-apply labels to content that satisfies certain conditions. The conditions now available support applying a label to content that contains specific words, phrases, or values of searchable properties. 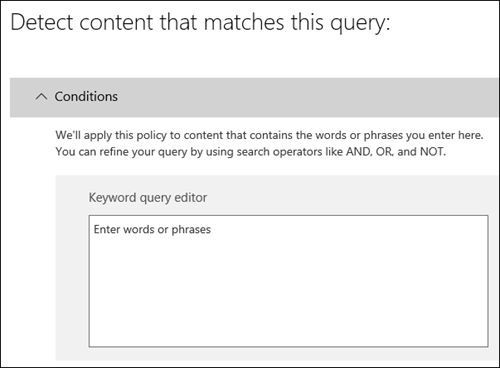 You can refine your query by using search operators like AND, OR, and NOT. In addition to enabling people to apply a retention label to individual documents, you can also apply a default retention label to a SharePoint library, folder, or document set, so that all documents in that location get the default retention label. For a document library, this is done on the Library settings page for a document library. When you choose the default retention label, you can also choose to apply it to any existing items in the library. For example, if you have a tag for marketing materials, and you know a specific document library will contain only that type of content, you can make the Marketing Materials tag the default for all documents in that library. All items in the library, folder, or document set automatically get the same retention label, except for items that have had a retention label applied explicitly to them. Explicitly labeled items keep their existing label. For more information, see the below section on The principles of retention, or what takes precedence?. If you change or remove the default retention label for a library, folder, or document set, the retention label's also changed or removed for all items in the library, folder, or document set, except items with explicit retention labels. If you move an item with a default retention label from one library, folder, or document set to another library, folder, or document set, the item keeps its existing default retention label, even if the new location has a different default retention label. 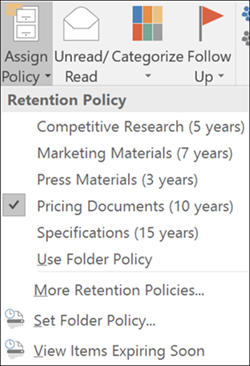 In Outlook 2010 or later, you can create rules to apply a retention label or retention policy. For example, you can create a rule that applies a specific retention label to all messages sent to or from a specific distribution group. To create a rule, right-click an item > Rules > Create Rule > Advanced Options > Rules Wizard > apply retention policy. When you create a retention label, you can do so without turning on any retention or other actions, as shown below. In this case, you can use a retention label simply as a text label, without enforcing any actions. For example, you can create a retention label named "Review later" with no actions, and then auto-apply that retention label to content with sensitive information types or queried content. Important content is classified as a record by users. A record can't be modified or deleted. Records are finally disposed of after their stated lifetime is past. 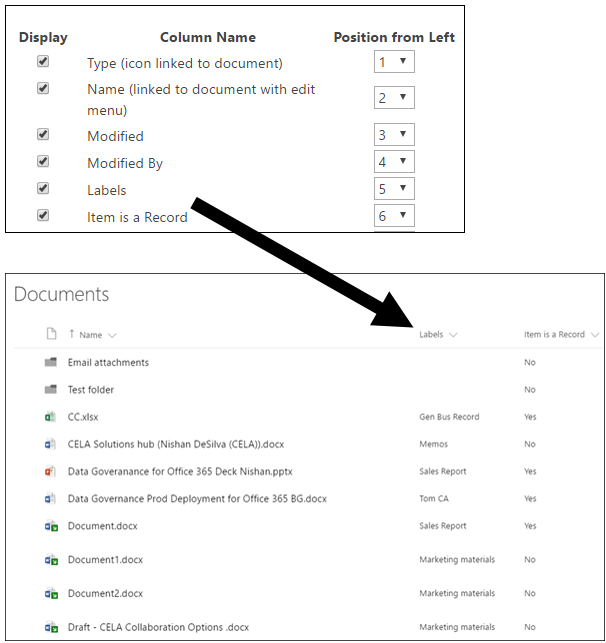 You can use retention labels to implement a single, consistent records-management strategy across Office 365, whereas other records-management features such as the Record Center apply only to SharePoint content. And you can enforce retention actions on records, so that they're disposed of automatically at the end of their lifecycle. When you create a retention label, you have the option to use the retention label to classify the content as a record. The item can't be permanently deleted. The item can't be edited. The label can't be changed. The label can't be removed. For SharePoint content, any user in the default Members group (the Contribute permission level) can apply a record label to content. Only the site collection administrator can remove or change that retention label after it's been applied. In addition, a retention label that classifies content as a record can be auto-applied to content. 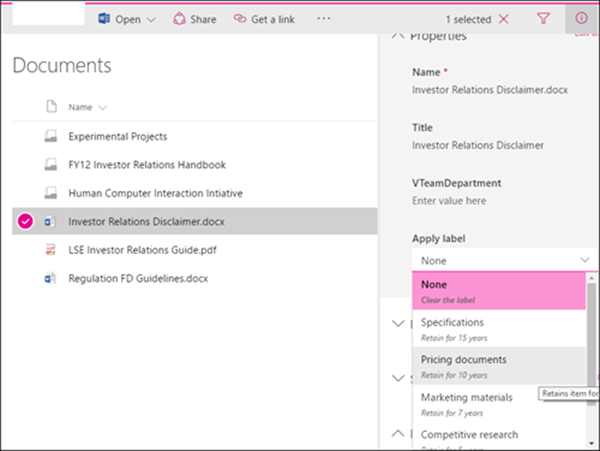 You can apply a retention label to a folder in Exchange, SharePoint, or OneDrive. If a folder is labeled as a record, and you move an item into the folder, the item is labeled as a record. When you move the item out of the folder, the item will continue to be labeled as a record. If you attempt to delete a record in Exchange, the item is moved to the Recoverable Items folder as described in How a retention policy works with content in place. If you attempt to delete a record in a SharePoint, you see an error that the item wasn't deleted, and the item remains in the library. If you attempt to delete a record in OneDrive, the item is moved to the Preservation Hold library as described in How a retention policy works with content in place. A retention label can enforce retention actions on content. In addition, you can use a retention label as a condition in a data loss prevention (DLP) policy, and the DLP policy can enforce other actions, such as restricting access, on content that contains a specific label. For more information, see Using a label as a condition in a DLP policy. Label Activity Explorer. With the explorer (shown below), you can quickly search and view retention label activity for all content across SharePoint and OneDrive for Business over the past 30 days. For more information, see View label activity for documents. Label analytics page. 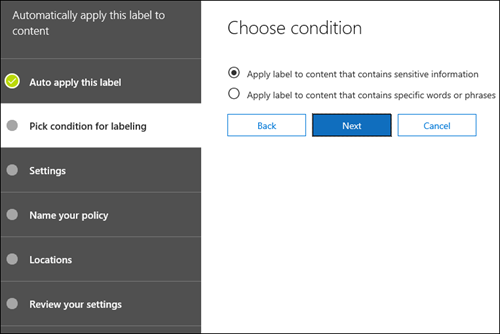 In the Microsoft 365 compliance center and Microsoft 365 security center, you can quickly view your top labels and where they're applied. You can also view all content with a specific label. For more information, see View label usage with label analytics. Data governance reports. With these reports, you can quickly view retention label trends and activity for all content across Exchange, SharePoint, and OneDrive for Business over the past 90 days. For more information, see View the data governance reports. After retention labels are assigned to content, either by users or auto-applied, you can use content search to find all content that's classified with a specific retention label. 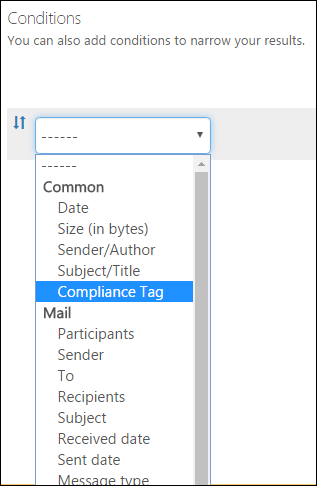 When you create a content search, choose the Compliance Tag condition, and then enter the complete label name or part of the label name and use a wildcard. For more information, see Keyword queries and search conditions for Content Search. If a retention label with retention settings is manually assigned by a user to an item, such as an Exchange email or OneDrive document, that retention label takes precedence over both a policy assigned at the site or mailbox level and a default retention label assigned by the document library. For example, if the explicit retention label says to retain for ten years, but the retention policy assigned to the site says to retain for only five years, the retention label takes precedence. Note that auto-apply retention labels are considered implicit, not explicit, because they're applied automatically by Office 365. Retention labels can easily be made available to an entire organization and its content across Office 365, including Exchange, SharePoint, OneDrive, and Office 365 groups. 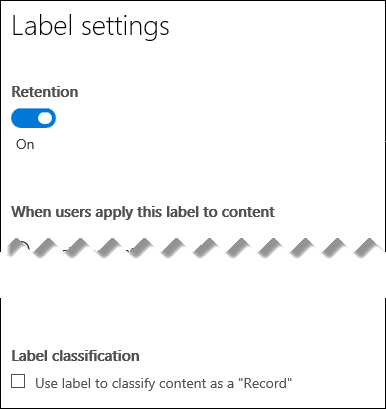 If you need to classify content or manage records anywhere in Office 365, we recommend that you use retention labels. There are several other features that have previously been used to classify content or manage records in Office 365. These are listed below. These features will continue to work side by side with retention labels. Note that while there are instances where the implementation of retention labels differs from previous features, the evolution of retention labels will drive the future of records management across Office 365. Therefore, moving forward, for data governance, we recommend that you use retention labels instead of these features. Members of your compliance team who will create retention labels need permissions to the Security & Compliance Center. By default, your tenant admin will have access to this location and can give compliance officers and other people access to the Security & Compliance Center, without giving them all of the permissions of a tenant admin. To do this, we recommend that you go to the Permissions page of the Security & Compliance Center, edit the Compliance Administrator role group, and add members to that role group. These permissions are required only to create and apply retention labels and a label policy. Policy enforcement does not require access to the content.